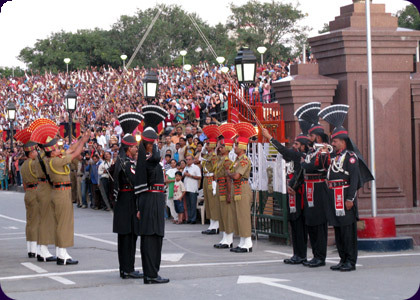 Every evening the only border crossing between India and Pakistan along the 3323 km frontier becomes the site of an extraordinary event. Border guards on both sides orchestrate a parade to lower the flags. Thousands of people gather to witness the ritual and afterwards the masses move as close to the gate as possible to greet their former neighbors. The film looks through the eyes of three children who sell DVDs of the parade to the onlookers. With a dream of crossing the border they remain quite unmoved by all the "patriotic" madness around them. A journalist turned independent filmmaker, Supriyo Sen has produced and directed feature and short documentaries like Wait Until Death, The Dream of Hanif, The Nest, Way Back Home, Hope Dies Last in War, Rupban—The Beautiful and Wagah. Supriyo has won more than twenty-five international awards for his films, which include Berlin Today Award at Berlin Film Festival, Crystal Globe at Karlovy Vary Film Festival, Grand Prix at Bilbao International Film Festival, BBC Award at Commonwealth Film Festival, Golden Lola, Black Pearl Award at Abu Dhabi Film Festival, National Geographic Award at Flickerfest, Golden Conch at Mumbai International Film Festival, Jury and Audience Award at Krakow, Hamburg, Munster, Uppsala, Huesca, Winterthur, Damascus, Zagreb, IFFI, Rio-de-Janeiro, Parnu, Faito and others. He has also won three national awards including Swarna Kamal for the Best Documentary of the Year. His two-hour-long feature Way Back Home is the first Indian documentary that has been commercially released. Supriyo has also received grants from Sundance Documentary Fund, Jan Vrijman Fund (IDFA) and Asian Cinema Fund.